Glashütte Original Music Festival Award is given for the support of young musicians in the Dresden Music Festival. In 2013, the German baritone Thomas Quasthoff became the winner. The reward - 25,000 Euros, has already found its hero in the 10th time. The ceremony took place on 22 May. The award was given to the Quasthoff’s wife and one of his students, who serenaded to the assembled audience. 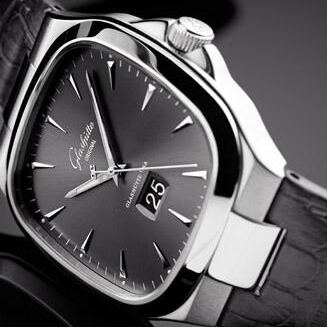 Official site of Glashutte Original. At the upcoming international watch exhibition Baselworld-2014, the company Glashutte Original will officially unveil a new timepiece PanoMaticInverse Automatic, released in two versions: stainless steel and 18K rose gold. Glashütte Original's partnership with the Berlin International Film Festival is an integral part of the cultural program of the company for the past 4 years. The famous watchmaker Glashutte Original presents the PanoLunar Tourbillon model. In Geneva, in the Rue du Rhône, which is the most exclusive shopping district of Geneva, where there are boutiques of international luxury brands, on November 27 this year, another boutique was opened. German watchmaker Glashütte Original has released a new version of the watch Seventies Panorama Date. German watchmaker Glashutte Original has recently introduced a collection of women's watches Pavonina. Models from the new collection are made in the style of watches of 1920s. Cases are pillow-shaped, made of steel or gold. At the annual exhibition BaselWorld 2013, the well-known German watchmaker Glashütte Original has introduced a new original model Senator Tourbillon. It is equipped with a "flying" tourbillion, which was invented in 1920 by Alfred Helwig. German watch brand Glashütte Original in 2013 has expanded the collection of classic models with two novelties - Sixties and Sixties Panorama Date, whose design is inspired by the watches of 60th of the last century. In the spring of this year, the famous watch brand Glashütte Original has announced the opening of its production of dials in Pforzheim. New equipment is put on the area of 1300 square meters. Despite this, most of the work is done manually. The German watchmaker Glashütte Original has released a novelty Senator Panorama Date Moonphase, which will be officially presented at the international watch exhibition BaselWorld 2013. At the annual watch exhibition BaselWorld 2013, the known German watchmaker Glashütte Original will present its novelty Senator Panoramadatum, which is made in a classic style. The watch company Glashütte Original enjoys great success throughout the world. Recently the women's collection Pavonina was presented at the Berlin gallery of the Contemporary Art Direktorenhaus. Recently, the famous Swiss watchmaker Glashütte Original has announced the continuation of cooperation with the Berlin Film Festival in 2013. In October 24 this year, the famous watchmaker Glashütte Original has announced the opening of its new boutique, which officially opened in the shopping gallery QF, in Dresden. German watch brand Mühle-Glashütte has announced the release of a new watch model S.A.R. Anniversary, used by the crew of a search and rescue service in Germany. This year in September the attention of world cinema audiences will be re-drawn to Zurich. From 20th of September, within 10 days film lovers and members of the cinematic process, which met in Zurich, will evaluate documentary and feature films presented at the competition. German watchmaker Glashütte Original has announced a new limited edition model of Senator Moon Phase Skeletonized Edition (Ref. 49-13-15-15-04), which embodies a unique combination of hand-engravers’ skill and modern high-tech of watch-making. Information watch portal montre24.com presents to all lovers of fine watch making and lovers of original watches an exclusive video clip of the famous German watch company Glashutte Original, which kindly opened the door of its pavilion at BaselWorld 2012. Legendary German watchmaker Glashütte Original at the world exhibition of watches and jewelry BaselWorld 2012 has introduced its new watch Senator Perpetual Calendar. Renowned watchmaker Glashütte Original at the annual exhibition BaselWorld 2012 has introduced a delightful PanoInverse XL watch, the world premiere of which took place in 2008. Renowned watch company Glashütte Original for the annual exhibition BaselWorld 2012 has introduced a new watch from the Pano. Handmade mechanical models of the company have won great popularity and fame. Saxon watch company Glashütte Original is known in the watch market for its exquisite wristwatches, both male and female. At the exhibition BaselWorld 2012 the manufacture has presented an excellent novelty - a women's watch Lady Serenade, made by hand. Saxon watch company Glashütte Original at the world exhibition BaselWorld 2012 has presented its delightful watch Grande Cosmopolite Tourbillon. The novelty was produced by brand’s designers and watchmakers after long and intensive developments. The German watchmaker Glashutte Original presents a limited edition model Senator Observer 1911 - Julius Assmann. This beautiful watch is dedicated to the memory of two outstanding individuals.